Playa Del Carmen is not only about beaches, or taking a leisurely stroll on the white sand, or participating in the adventurous water sports activities – It is much much more!! 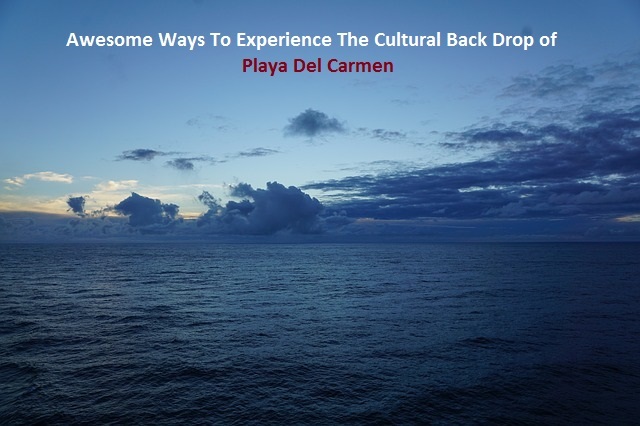 For all those who wish to experience the other side of this beautiful region of the Caribbean, while vacationing aboard a yacht rental in Playa Del Carmen, there are many great Playa del Carmen cultural tours that many people don’t even know about. These tours must be part of the travel itinerary of every savvy traveler who wants to know the region they are visiting. No doubt, a visit to the Mayan ruins at Chichen Itza or Tulum is both enriching and entertaining, however, it's not the same as experiencing some of the region's modern-day attractions. When the sun has set over the Caribbean and the lights turn on in Playa’s bustling downtown area, the tourist zone turns into a playground for those looking to explore the town’s more wild side. But it’s not all party!! You can also experience the finest Mexican folklore at Xcaret, see an amazing Cirque Du Soleil performance or let yourself mesmerized by the theatrical performances and shows performed by the locals. MAYAN VILLAGE TOUR – Step out from your private and luxurious yacht and make your way to the land that the Mayans have called their home for centuries – all away from the hustle and bustle of the city life. Interact with the native Mayas of Playa del Carmen and learn about the traditional Mayan life. It is a truly fascinating excursion that will leave you really feeling awesome when you learn more about the rich history of the Mayan culture, and how they live today. The Mayan people will enthusiastically reveal their real way of life to you both then and now. XCARET AT NIGHT – Playa del Carmen's most spectacular celebration of Mayan culture is Xcaret at Night! This show goes way beyond Mexican Fiesta and into the realm of the total Mayan experience. Somewhere around 300 performers will give you a glimpse of the history and culture of Mexico from the ancient Mayas to Playa del Carmen now. There is simply nothing else quite like Xcaret at Night. If you add Xcaret Xclusivo to your Xcaret itinerary, you can enjoy a reserved seat at the Grand Tlachco Theater, and an exquisite selection of dried fruits, one bottle of sparkling wine, soft drinks for children will be served during the presentation as well. CIRQUE DU SOLEIL THEATRE SHOW – Delve into a fantasy world of fairy creatures and follow a girl's astounding adventure in a surreal jungle. The first permanent Cirque du Soleil resident show outside the United States and Canada is a guaranteed world-class entertainment not to be missed while vacationing aboard a private yacht rental in Playa Del Carmen. The young teenage girl, whose name means jewel in Spanish, in order to discover life's meaning embarks on a mysterious journey. As she leaps from one escapade to another through thrilling acrobatics, witness her inspiring quest full of adventures and the mesmerizing views of the surroundings. COCO BONGO – VEGAS STYLE SHOW – Enjoy an exhilarating evening of spectacular music and pageantry at Coco Bongo. Enjoy the world class breathtaking aerial acrobatics and Las Vegas-style performances as you sip a drink from the open bar. Tap your feet to the tunes played by the hottest DJs and join in a conga line. With film clips projected on high-tech video screens and live bands serving up salsa, rock music entertains a huge crowd every night. The dance floor is always packed with people dancing and enjoying themselves, and you can expect a full dance floor until the night ends, and when it does the Coco Bongo floor is filled with soap bubbles, confetti, and balloons. The exciting, celebratory atmosphere keeps party-goers flocking to this venue again and again. And these are just some of the great and fun-filled cultural activities in and around Playa del Carmen that you should not miss while you are on your personalized trip on board a private yacht rental in Playa Del Carmen.